Kyle Edmund has already lifted his game to new territory in 2018 but as he tells Mathieu Wood, victory at the European Open for his maiden professional singles title appears to have only strengthened his resolve to further his potential. What constitutes success is often hard to assess, especially when the athlete has undoubted ability, and greater expectation can often weigh heavy. Edmund possesses talent in abundance and a forehand which many of his counterparts on the ATP Tour could only wish for but a dedication to the sport is also paramount. The 23-year-old struggled to find his best physical levels in his formative years in the professional ranks but a landmark season has owed much to the progress he has made in that department. It just gives you that confidence for the future, knowing that you can win titles on tour level. Injury to Andy Murray - so long Britain's go-to man for hopes on the sport's biggest stage - presented an opportunity for Edmund to emerge from his shadow. That wasn't a certainty but he has made it a reality. Edmund has become a presence in the upper echelons of men's tennis through a will of desire and his title in Antwerp was a deserving reward. The outpouring of emotion after his forehand winner on match point said as much. This is what it means to win your 1st @ATPWorldTour 🏆. Take a bow @kyle8edmund! Just don't go telling him it was confirmation of his endeavours. "Even if I hadn't won the match on Sunday it still would have been a good year with my ranking and other results, particularly the big one in Australia," Edmund told Sky Sports. "It was just more of a goal that I have had through the year. You always want to get that first professional title under your belt. "It was never like I had this sense of waiting - it has happened and I have now got that winning feeling. It just gives you that confidence for the future, knowing that you can win titles on tour level." An emotional Kyle Edmund celebrates his maiden ATP Tour title after victory against Gael Monfils at the European Open in Antwerp. 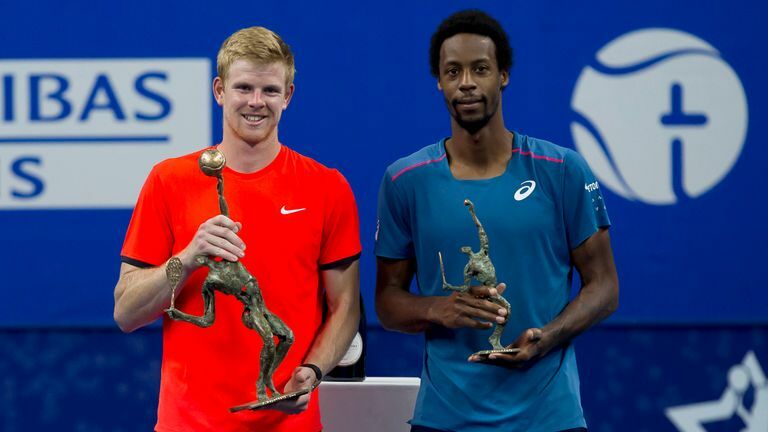 Edmund had sailed through to his second professional singles final of his career in Antwerp - an ATP 250 event - without dropping a set or serve for that matter. But in experienced Frenchman Gael Monfils he faced a difficult obstacle. His task increased when he lost the first set but just as in many of his notable victories of this campaign he found a way to swing the momentum in his favour. Under the tutelage of his coaching staff Fredrik Rosengren, Mark Hilton and long-time fitness coach Ian Prangley, Edmund has discovered a steely determination, beneath the shy understated exterior, to achieve greater results. Victory at the weekend came six months after defeat against Pablo Andujar in his first showpiece occasion in Marrakech. "When you are in finals, sometimes you like things to go to plan but they don't always," he said. "In terms of losing the first set it was more a case of just fighting, not necessarily knowing you are going to win the match but just giving myself a chance. "Fighting is the only option to do that - making it as tough as you can and win games to at least put yourself in the position. That is how the match went - getting to the tiebreak and playing some good tennis. It wasn't all one-way traffic. "Getting to the tiebreaks was the key and that is something you learn with experience over time. "Maybe at 18 or 19 you don't think like that. But by playing better you learn that if you do put yourself in positions you have always got a chance." After his memorable fortnight in the roaring heat of Melbourne, Edmund then impressed on the clay courts - including a notable victory against Novak Djokovic in Madrid - before receiving a vocal home backing at Wimbledon. His four-set defeat to eventual champion Djokovic on the middle Saturday was a captivating watch and bearing in mind the Serb's ongoing form could easily be viewed as another significant moment. It was pretty simple after the US swing what needed to happen. It wasn't rocket science. But Edmund hit a road bump as he was hit by a bout of tonsillitis in the aftermath and subsequently struggled to rediscover the edge during the US swing. The British No 1 exited Flushing Meadows at the first round as he struggled physically in the soaring New York heat. "It was pretty simple after the US swing what needed to happen. It wasn't rocket science," Edmund added. "It was just a case of wanting to get my fitness up, which is normal after being a bit ill.
Greg Rusedski feels the only thing lacking in Kyle Edmund's game is consistency as the British No 1 edges ever-closer to an improbable spot at the ATP Finals in London. "Even if you don't play sport, and then a person that has been ill goes to the gym they are going to feel rusty. In the long term I can learn from that experience. "Touch wood I don't get ill, but if I do then I know what is required of my body to sort of get back up again." The world of professional sport doesn't provide much time to switch off and straight from his title-winning achievement in Antwerp Edmund has his next tournament to focus on this week at the Erste Bank Open, live on Sky Sports. Diego Schwartzman will provide his first hurdle in Vienna - an opponent who beat Edmund emphatically in Toronto during the summer - but the Briton is once again a different prospect. Back up to a career-equalling high world No 14, the opportunity to make a late qualification push for the ATP Finals has materialised but it is not front and centre of his thoughts - just yet! "In terms of last week I haven't been thinking about it because it was just a case of knowing I had a great opportunity to when playing well to win my first title," he said. "Rather than thinking I was playing for The O2 I was playing because I wanted to win the tournament. I know I am there or there about. "Even if I did really think about it, the best way to go about it would be one match at a time. That would be the sensible way to do and that is how I have been going about my tennis - not looking too far ahead of myself. "I know I am going to have to win some matches, maybe a tournament this week or next [the Paris Masters]." These words demonstrate a clear focus of mind - something which became an attribute of his countryman and former world No 1 Murray. The three-time Grand Slam champion, who is working towards a return to full fitness for next season, was one of a number of counterparts to get in touch with their words of congratulations at the weekend. The support and backing is not lost on Edmund. "[Andy] has sent me a message just saying well done and it is always a great feeling to win your first title," he said. It was pretty similar to what a lot of people have been saying to me. I have had quite a few messages come through. His brother [Jamie] did. Tim [Henman] and Greg [Rusedski] did so it has been great to get that from the fellow British guys. "You could say they are legends of the British game so it was really nice they recognised my success and want to congratulate me on that." As the long season approaches its conclusion, Edmund is keen to stress the importance of how he prepares for next year and his return to the Australian Open. Attending a Liverpool match is an aim during his period of rest and recovery before the hard grind starts once again as the inevitable expectation comes his way in the New Year. "If you don't give the mind a rest then it becomes lazy," he said. "At the end of the season - whenever that is - I will just put down the racket and have a break away from tennis." He added: "It is tough to just say I am going to make the semi-finals of a Grand Slam. You can't expect any results - you have to earn it. "If you do, you are not respecting the tournament because there are so many good players. If you are overconfident that will bite you on the backside when it comes. "You can't expect any results - you have to earn it." From what we have seen from Edmund in both his career to-date and specifically this year, it would be hard to imagine anything other than him only maintaining his steady incline on the climb to greater heights. Watch Kyle Edmund's opening match at the Erste Bank Open in Vienna against Diego Schwartzman, live on Sky Sports Action and Sky Sports Main Event from 12:00 on Wednesday.